Strapline: "The Most Dangerous Place on Earth"
A climbing expedition on Mr. Everest is devastated by a severe snow storm. 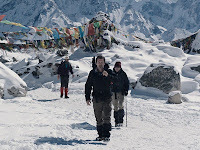 Everest centres on the story of Rob Hall (Jason Clarke) whose expedition tour company Adventure Consultants paved the way for paid expeditions to Everest. His men and $65,000 a-pop customers attempt to make their way to the summit. 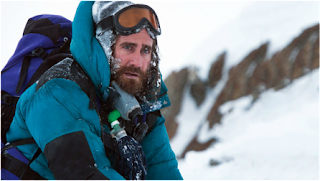 Accompanying Hall is Scott Fischer (Jake Gyllenhaal) a rival tour operator heading for the summit at the same time with his group of men. 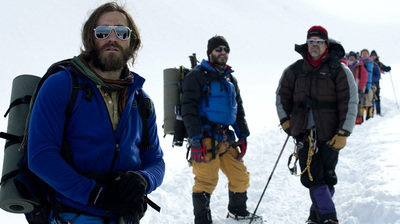 I enjoyed Everest it's a good movie, just not a great one. This tale of real-life tragedy on the mountain never quite hits the height it should. Despite the visual grandeur of its setting and the haunting drama of its true story (it’s a retelling of the disastrous 1996 ascent of the mountain in which a number of climbers, both amateur and professional, lost their lives), it's story never penetrated me the way it should have done. The experienced cast work well together and despite being perhaps the heaviest billed poster this year, all stars mesh nicely together, one upmanship is firmly out of site. Clarke front and centre gives a solid turn as the decent and likeable Hall. With a performance thankfully a world away from his this summer's John Connor in Terminator Genisys, much more similar to his role in Dawn of the Planet of Apes (2014). Jake Gyllenhaal is perhaps the most feisty male explorer, as one might expect, but feels slightly sidelined, and whose character is underdeveloped. Josh Brolin as Beck Weathers is good but also underwritten. This is also the case for the Sherpas and the female characters, including perhaps the most affecting tale of the movie. Yasuko Namba (Naoko Mori) a customer of Hall's, recounts that she has climbed six summits, and this is the last on her list. This story which is easily the most interesting is just brushed over. Emily Watson who puts in the movies best performance as base camps mother hen is also underwritten. Keira Knightley and Robin Wright as the wives of Jason Clarke and Josh Brolin respectively, though play the stereotypical worried wives back home. As I mentioned at the start of this review I saw it in IMAX 3D, and this movie was made for that experience, although not filmed in native 3D. So to get the full impact, I implore you to follow my lead in that regard. The movie from a visual standpoint is pretty thrilling. There are some great moments that show you just how insignificant humans are when it comes to the sheer scale of this locale. The vistas and drops with the aid of an IMAX screen and 3D effect come to life and at times I felt I was on that mountain with them. The on-location footage and CGI blend nicely, which I must admit heading in was one of my worries. My only issue with the visuals is that Kormákur never stays for long on any one shot, so although impressive there are no absolute stomach churning moments. The sound by the way is also excellent and really adds to the experience. 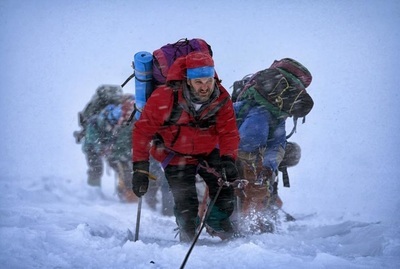 Visuals aside what Everest did manage to convey was just how horrific this true life undertaking really is. One minute you are at base camp swigging tea, checking kit and calling loved ones and the next you are fighting for every breath as you are literally shutting down in sub zero temperatures. 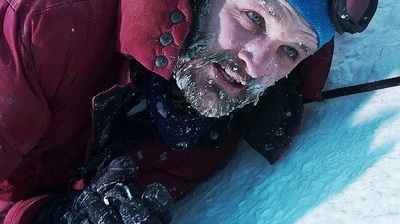 As Jason Clarke's character nicely puts it "The human body is just not designed to function at the cruising altitude of a 747". 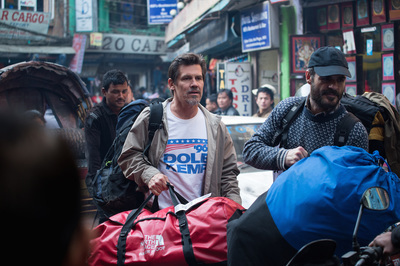 My issue with Everest is that the human drama never gets any real traction, it's like it slipping on ice. It's just lost to the sheer majesty of the visuals. At one point in the movie at base camp, the guys (decked out in defacto thick wooly jumpers), swap stories of why they are attempting to make summit, but due to the weak script I could not connect with them as I did not know enough about them. Therefore when the film started to tragically unravel during the last act, my heart went out to the real people of course, just not the characters on screen. Visually Everest is a must-see. Especially in IMAX 3D. Stunning vistas, drops and set pieces keep this movie afloat, aided by excellent sound design. The movie conveys the horror and majesty of this undertaking well, but despite good performances from an experienced cast, the memory of the brave men and women lost has been robbed by weak script and a severe lack of character development.